Harrisburg, Pennsylvania (January 3, 2017) — Sixteen Harrisburg area coffee shops and Bethesda Mission are spreading the love this winter. They’ve launched Bethesda Mission’s #iheartHBG and they’re asking central Pennsylvania to join them. When patrons at participating coffee shops purchase a cup of coffee, they will receive a free #iheartHBG cup sleeve and are encouraged to post their pictures, love and support for Harrisburg on Facebook, Twitter or Instagram. While the central goal of the campaign is to rally community pride and boost small business participation, patrons also may leave a business card or donation. Business cards will be used to contact those who may be interested in volunteering for Bethesda Mission; donations will be used to support the expansion of the Bethesda Mission Community Center. The Bethesda Mission Community Center opened in 1990 on Herr Street on Allison Hill. The center provides services and activities for Harrisburg children, teens and families. Fundraising for the center’s expansion project is underway. The renovation would upgrade the current facilities HVAC, plumbing and electrical systems, as well as add services and space for a gym, creative arts, education and IT support systems, music studio, banquets/large events, outdoor play area and senior activities with the ability to serve 150-200 kids and families. Bethesda Mission has been providing hope and healing to hungry & homeless people in the Greater Harrisburg area since 1914. 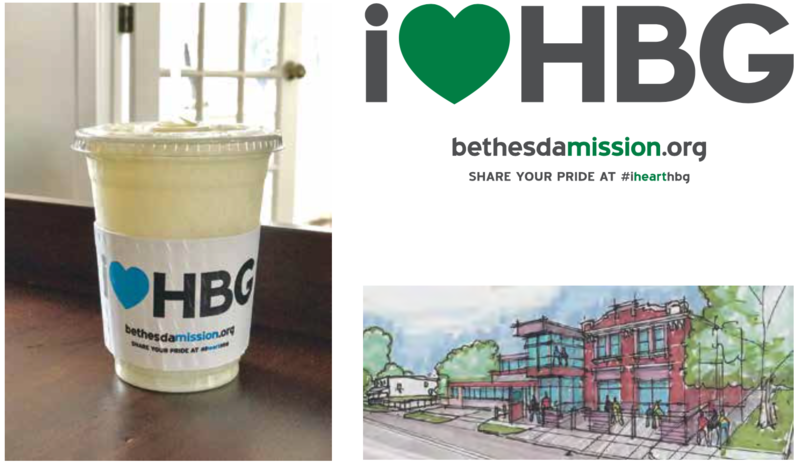 See attached images of coffee cup sleeves, campaign graphic, Bethesda Mission Community Center rendering.